Company - Ο.Λ.Κ. - Οργανισμός Λιμένα Καβάλας Α.Ε. The organizational structure of the company “Kavala Port Authority S.A.” depicts the needs of the sectors in which the company is active, while at the same time it isin accordance with the given principles of the legal background that determine the company’s operation. The organizational chart of the Kavala Port Authority S.A. is depicted in the following figure. The work of the Departments is completed by the Independent Services. font-awesomeKekropoulos Grigorios, Member representative of the employers of Kavala Port Authority S.A.
font-awesomePardalidis Nikolaos, Member Representative of the Hellenic Dock Workers Union. 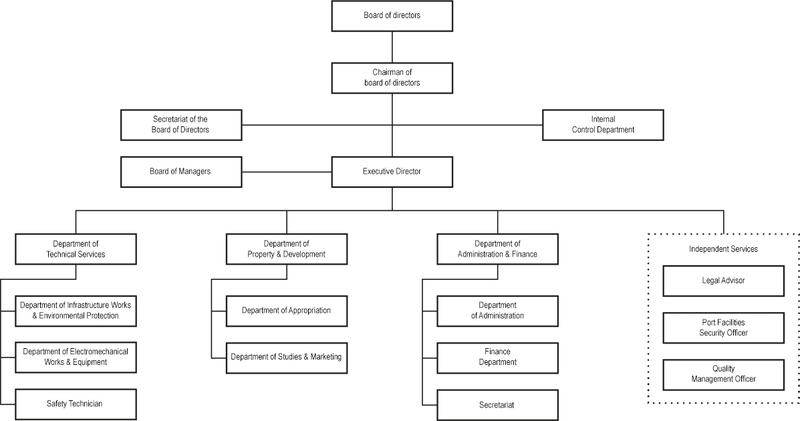 Organizational chart of Kavala Port Authority S.A. The special advantages connected to the geo-strategic position of our ports signify the perspectives for the financial development of Kavala, as well as the wider area of East Macedonia and Thrace and South – South East Balkan. In the present especially difficult and uncertain socio-economic environment we have to work in a perfect cooperation with the local and regional authorities, social bodies and the Central Port Authority of Kavala. Our goal is the constant improvement and exploitation of the existing port infrastructure and the creation of new infrastructure, in order to provide port services of high quality in competitive prices. Combining business initiatives with social sensitivity and economic efficiency, we expect our ports to be a real instrument of economic development for the local area. Our vision is to make the port system of Kavala an important junction of maritime transports in the wider region, with special emphasis on the East Balkan area.